We could have remained sheltered in our homes had it not been for the threats and hostile demonstrations of our enemies. Our only means of avoiding a rupture was by starting in midwinter. Our homes, gardens, orchards, farms, streets, bridges, mills, public halls, magnificent Temple . . . we leave as a monument of our patriotism, industry, economy, uprightness of purpose and integrity of heart (History of the Church, 7:603). The Saints were, this time, leaving not only their homes and city behind, but (as they thought), their country. Heading for the unsettled West, they intended to leave the United States, where they had endured so much persecution. However, the Utah Territory, where they settled, soon became part of the United States after the war with Mexico. My last act in that precious spot was to tidy the rooms, sweep up the floor, and set the broom in its accustomed place behind the door. Then with emotions in my heart…I gently closed the door and faced an unknown future, faced it with faith in God and with no less assurance of the ultimate establishment of the Gospel in the West and of its true, enduring principles, than I had felt in those trying scenes in Missouri. Joseph Smith, first prophet of The Church of Jesus Christ of Latter-day Saints, had been martyred on June 27, 1844, and since that time, tensions had steadily mounted between the Saints and their neighbors. Despite efforts at peace and resolving differences, Brigham Young (Joseph Smith’s successor as prophet) realized the Saints would have to leave if they hoped to be left alone. Tensions were so high, they couldn’t even wait for the spring. As temperatures plummeted, the Saints gathered what they could bring with them and prepared to leave in the middle of winter for an as-yet-unknown destination. I was five years old when we started from Nauvoo. We crossed over the Mississippi in the skiff in the dusk of the evening. We bid goodbye to our dear old feeble grandmother, Lucy Mack Smith. I can never forget the bitter tears she shed when she bid us goodbye for the last time in this life. She knew it would be the last time she would see her son’s family (Martha Ann Smith). It was with astounding faith that so many left behind their homes in the dead of winter for a completely unknown future. This is why their courage is still so inspiring today and why it is important to remember their sacrifices. Celebrating the sesquicentennial of the original Saints’ departure from Nauvoo, more Saints gathered in Nauvoo to remember the trials and sacrifices of those who had gone before. The weather in 1846 was even colder than normal, finally allowing the covered wagons to cross a frozen river rather than taking a precarious ferry ride dodging ice flows. George Q. Cannon, who later became an apostle for The Church of Jesus Christ, recalled the trials of the Saints’ departure in the frigid winter. Those of us who can remember when we were compelled to abandon Nauvoo, when the winter was so inclement, know how dark and gloomy the circumstances of the Saints were, with the mob surrounding our outer settlements and threatening to destroy us and how trying it was to the faith of the people of God. The word was to cross the Mississippi and to launch out into an unknown wilderness–to go where, no one knew. Who knew anything of the terrors of the journey thither, or of the dangers that might have to be met and contended with? Who knew anything about the country to be traversed? Moving out with faith that was undisturbed by its unknown terrors. It was by faith that this was accomplished. 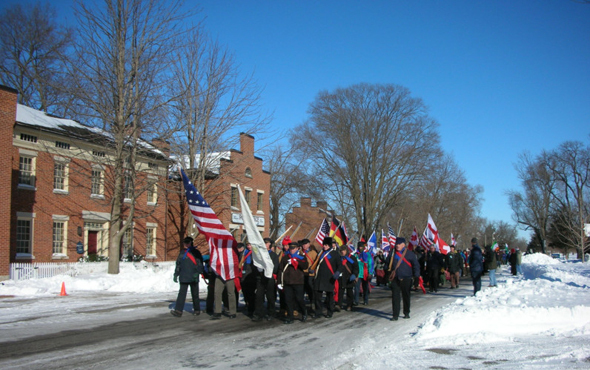 Since the sesquicentennial in 1996, an annual commemoration has been held in Nauvoo. Those who wish to participate gather and walk through the town down to the river. In 2013, many Latter-day Saint senior missionary couples participated in the walk. Many carried flags of countries where many of the original Saints had immigrated from. While singing hymns and being able to feel personally at least a part of what the original Saints must have felt, participants carried the American flag down to the river and raised it there. Beginning in 2011, another annual event has been held in conjunction with the Exodus walk. The Untold Nauvoo Stories Symposium (sponsored by the City of Nauvoo, the Nauvoo Tourism Office, the Joseph Smith Historic Site, and the Historic Nauvoo Visitors’ Center) is growing larger every year with participants from the community. Historians and residents share stories of many of Nauvoo’s past inhabitants—Mormon and non-Mormon alike—to learn more about Nauvoo’s past through stories, photos, and music. Participating in events like these help us to remember and learn from our past — not only remembering sacrifices great people made in order to make life easier for the rest of us, but also remembering the injustices that others helped perpetuate out of ignorance. We need to be aware of others’ beliefs and try to understand them. We need to remember that it is not right to act in fear and anger to the harm of those around us.